A couple of days ago I had no reason at all to go outside. I was sitting at home, doing some work and watching the raindrops slowly sliding down my window. Looking at this huge grey shield, which wouldn’t let the sun shine through even by an inch, my depression started to crawl up my whole body. I cannot stay inside the whole day.. even if it is raining. 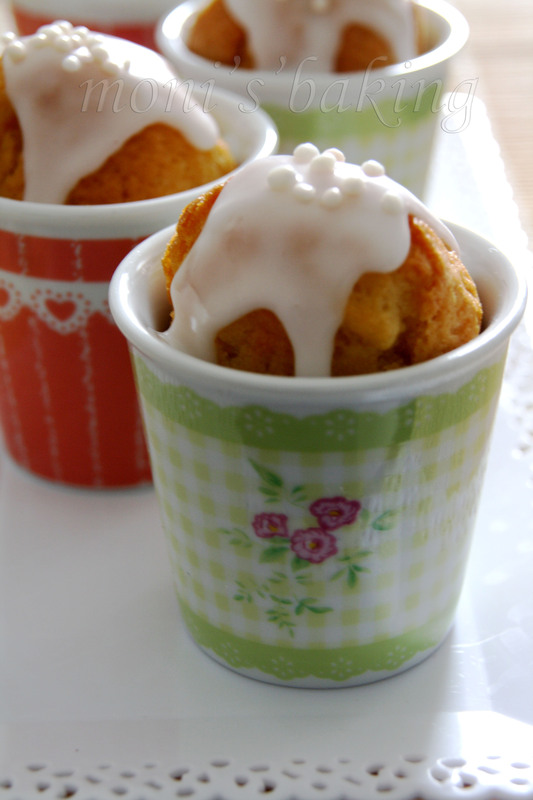 Plus, I remembered these nice decorating pearls and sugars at this store. I bought some red and green on my trip to the US a couple of weeks ago, but this one was blue and white.. and I could use some winter-snow-like-feeling. I took my little red umbrella and followed my mission “snowflake pralines”. I somehow also had a craving for hazelnut and nougat. I bought the decoration, chocolate, nougat and a package of whole hazelnuts. That is all you need for your pralines. I also had some white chocolate left at home for the decoration and I was good to go. 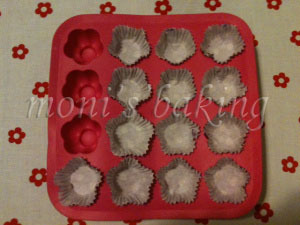 First I took an ice cube mold from Ikea (the same I used for the last pralines). 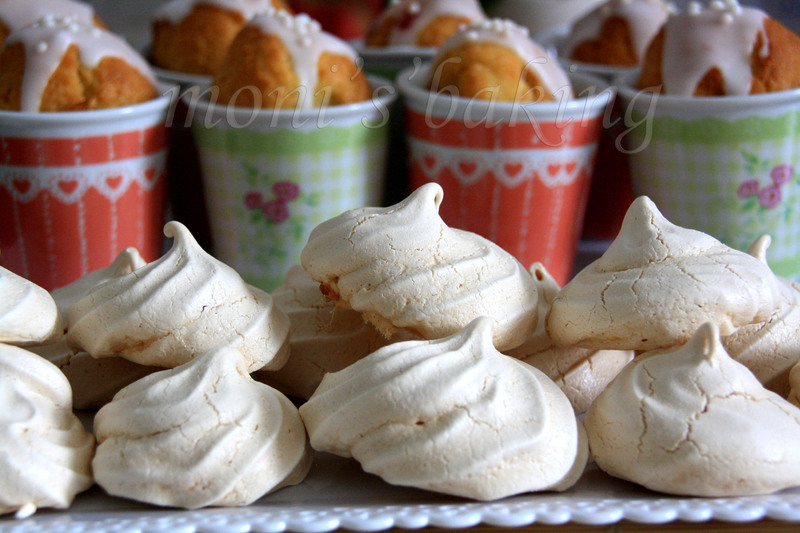 I filled the spaces with praline paper cups, but didn’t press them down entirely. I wanted it to be more star shaped than flower shaped and that is what happens, when the paper cups stand out a little. 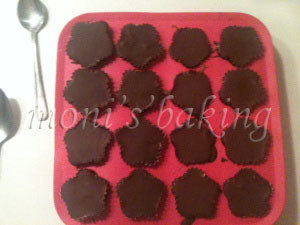 I filled the paper cups with one teaspoon of melted dark chocolate. 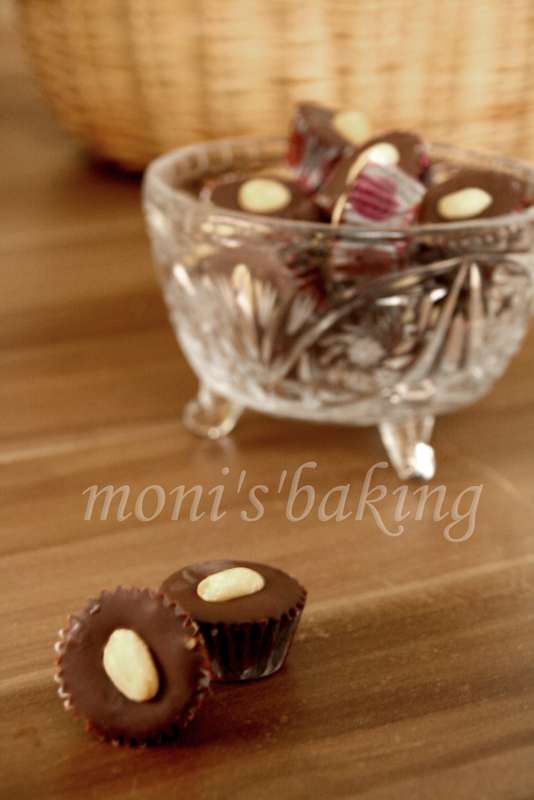 Make sure that the chocolate covers the entire inside of the paper cup. Then I put it into the freezer for a couple of minutes. Meanwhile I melted the nougat and added some vanilla and some rum (just a hint of both of them). Of course you can leave the nougat plain or add anything you like. 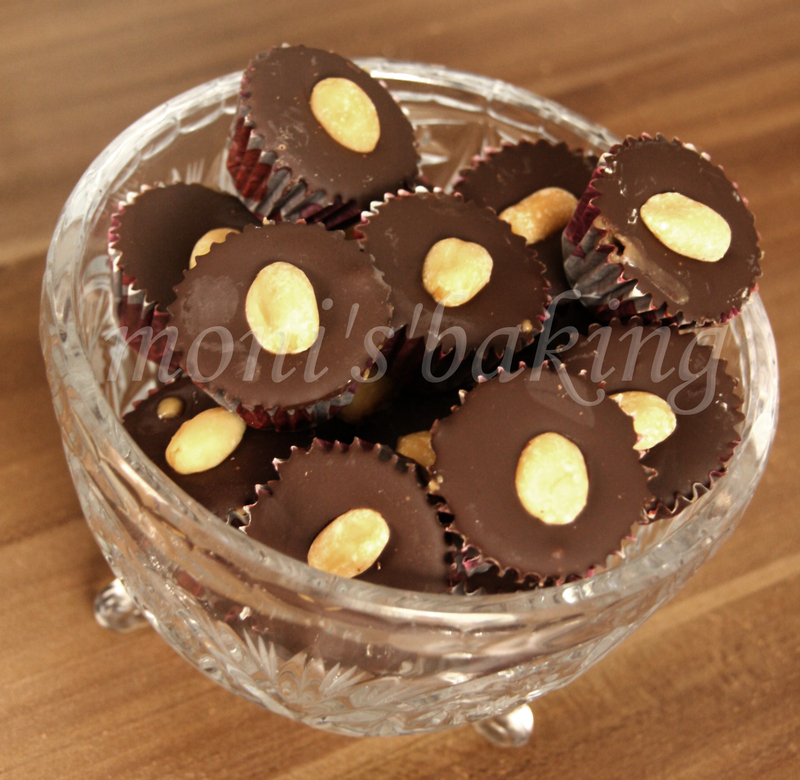 I don’t have a recipe for this.. it’s just a spontaneous fun thing, so you can add whatever you want 🙂 Next I put some hazelnuts into the nougat in order to cover them and put one hazelnut into each of the frozen chocolate cups. In some I put two, because I had too many, but they came out really good with two as well. Just find out what you like. 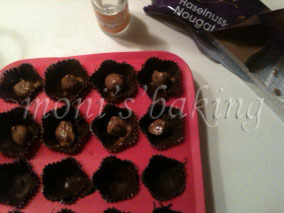 After that, I filled some more nougat into the cups and filled them up, leaving a little space for the chocolate cover. I put the pralines into the freezer for another few minutes. 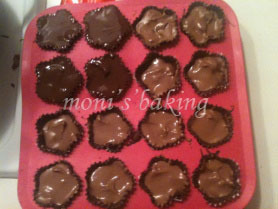 I melted some more chocolate to cover the pralines. 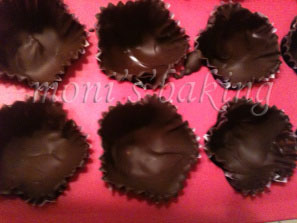 You need to jiggle the moulds a little to smooth the chocolate and get bubbles out. For the last time before decorating I let the pralines freeze. 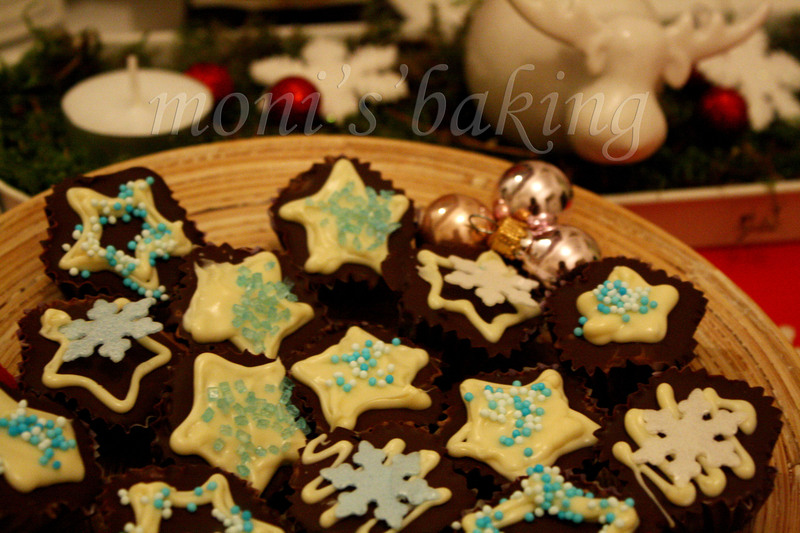 For the decoration I melted some white chocolate and followed the outlines of the pralines to draw white stars. Some I filled, others I left only with the frame. Be creative. 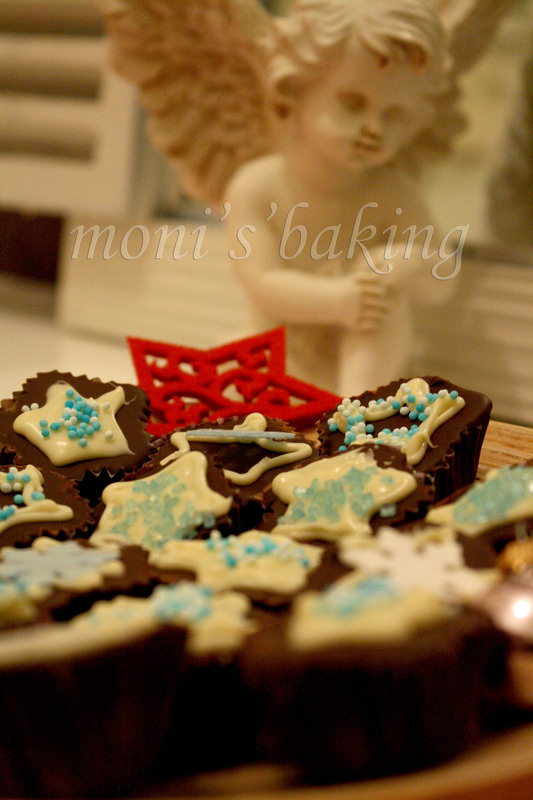 I decorated the pralines with the blue and white decoration I bought and let them dry.